On September 19, 1961, Betty and Barney Hill, along with dachshund Delsey, were returning home to Portsmouth, New Hampshire, traveling south on US Route 3. At approximately 10:15 pm they noted a “bright star” which appeared to move erratically. They continued to watch it as it apparently paced them and got closer and closer. Barney stopped the car, and the couple looked at the object through binoculars. They saw a spinning, flattened circular disk with multicolored lights on the rim. About two miles north of North Woodstock, the object descended and hovered about 100 feet in the air in front of the Hill’s car. A blue-white fluorescent glow shone through its windows. Barney stopped the car and got out. He could see several uniformed, human-like figures and grew frightened, jumping in the car, and driving down the road. Suddenly, the Hills both heard an irregular beeping sound, felt a tingling sensation and became drowsy. The next thing they remembered was a second series of beeps, and they were driving through Plymouth, New Hampshire. It was two hours later, and they had no memory of what had happened to them. However, they both reported feeling clammy and dirty. 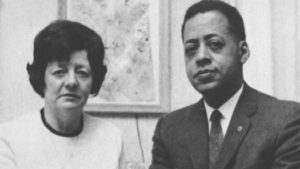 Betty and Barney Hill came to believe they had been abducted by aliens. Around two years after the incident, they began to visit Dr. Benjamin Simon, a Boston psychiatrist and hypnotherapist. Dr. Simon began hypnotizing the Hills on January 4, 1964. He hypnotized Betty, 41, and Barney, 39, several times each, and the sessions lasted until June 6, 1964 (over 9 hours of recordings were made). Simon conducted the sessions separately, so Betty and Barney could not overhear one another’s recollections, which turned out to be remarkably similar. At the end of each session he reinstated amnesia. Dr. Simon admitted privately, in correspondence, that he did not not believe the Hills were abducted. Instead, he felt that they were re-living a dream that Betty had experienced right after the incident, and which she had discussed with her husband. He believed the dream had been transferred to Barney, an example of folie à deux whereby a delusion or hallucination is transmitted from one person to another. Listen to the hypnosis session here. This was written by Mikita. Posted on at 9:36 pm. Filed under hypnosis session, interview, UFO abduction. Tagged UFO abduction. Bookmark the permalink. Follow comments here with the RSS feed. Both comments and trackbacks are currently closed.